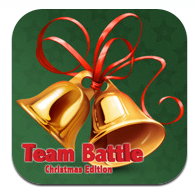 Build your own game, or follow the bundled Christmas Quiz with Team Battle! Full customizable Board game for iPad in which you an your friends can use your iPhone, iPad, Android, BlackBerry and Nokia phone as clients to book the answer! A Smartphone however is not mandatory! You can simply tap on your seat on the board and compete for answer :)read more on Team Battle section here.